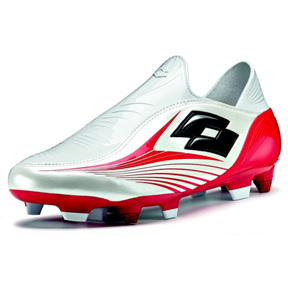 The Lotto Zhero Gravity Due FG-2T Soccer Shoes features a revolutionary design with NO LACES and exchangable studs for use on both soft and firm ground. The world's first ''LACELESS'' soccer cleat allows maximum surface area for ball contact resulting in unsurpassed shooting power and accuracy! Upper: Lightweight, water repellent, breathable and anti-abrasion Microfiber with a new exclusive laceless design with Pro Fit technology for superior fit and comfort. External Pebax heel counter provides protection and support. Features a Dual Fit system with a double set of removable insoles. Outsole: Pebax and TPU with Neo Switch technology made up of seven fixed blade studs and four interchangeable conical studs to ensure maximum stability on firm and soft grounds. Features Lotto's exclusive Puntoflex technology, positioned crosswise on the outsole at the metatarsal zone level, allowing the correct flexion of the foot. Includes stud key. Made in Italy.